Gosh, it seems like ages since the last time I received any new books at the library. And let's be honest, a big part of the reason why I became a librarian was for collection development... at work, I can "collect" books on a grander scale than I ever could at home. Series is the name of the game. Series, series, series. That's what kids clamor for, and so, that is what I shall give them. I'm beefing up the collection of "boys books" and things that seem to have universal appeal for boys and girls. I hate that books, from picture books, right up through YA seems to be so gendered, but that's the way of things, I suppose. I am in LOVE with the new Dear America covers. They have just a hint of gold leaf -- so elegant! It makes them seem simultaneously more updated and more historical, if that's possible. This picture does not do the book justice. I am so excited for the new Incorrigible Children book. I can't believe it doesn't have any holds on it. Lucky me, that means I can check it out for myself, right away. Nice collections! Wish that there were more books that appealed to both genders, so the ones that are out there are doubly precious! And the Dear America covers are nice, aren't they? Very classy! I LOVE the Incorrigible Children! Such a cute series! @Amber - I know, right? I usually think of Daniel Kirk as a picture book author. 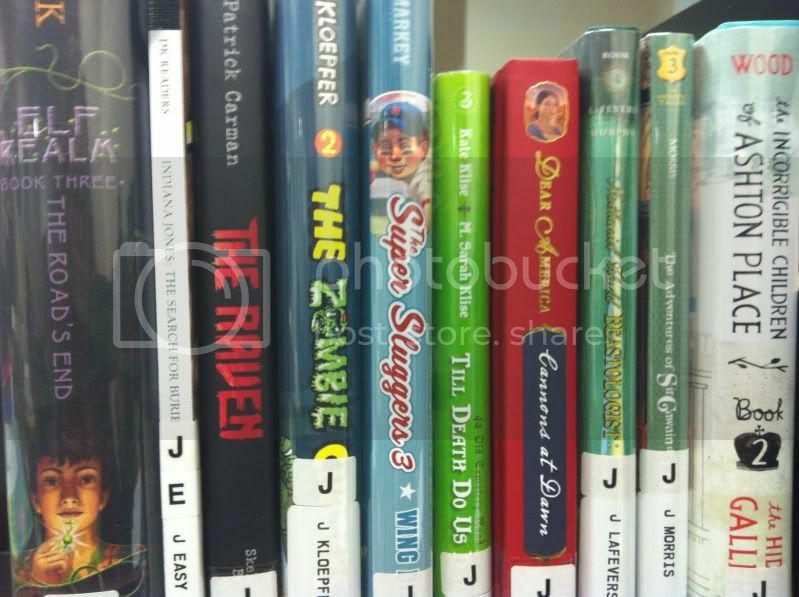 @Chelsey - Having free access to great book is definitely one of the perks of the job! I don't get to skip ahead of our patrons though. In fact, sometimes I'll wait to get a book if demand is very high... I don't want to keep someone else waiting on a popular book, especially since my TBR pile at home always seems to be towering. @Maestra - I liked the Incorrigible Children so much more than I thought I would! Their governess is really a hoot. I feel so protective over my library books. It's like I think of them like they're mine and I'm just being nice and lending them out :P It'll be a big shock when I move and lose them! Those new Dear America books look fantastic. I know just what you mean when you say they look updated and more historical. I know it... I've been moved around to 5 different libraries in the last 2 years (I blame the recession) and it's always a challenge to learn a new collection. Hopefully (knock on wood) I'll stay in my current position for a good long while!